If that sounds like you, don’t despair. 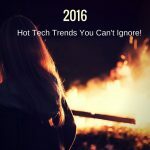 There are hot tech trends you can’t ignore. But, the good news is that most of them are existing technologies and you may have already experimented with a few yourself. This is the year, however, that these trends explode and experimentation has to make way for utilization. Here are the 6 small business tech trends for 2016. Paying with a smartphone at the register isn’t new, but technologies are coming that are not only more sophisticated, but safer, too. MasterCard recently announced it will soon use fingerprints or a selfie to verify identities when paying with a smartphone. Visa is working on mobile payment options embedded in a car’s dashboard touch screen. More ways to get paid is always good for business. Users love videos. Bing and Facebook now offer advertisers video options. Even better, Google includes video in its algorithm, meaning that videos now show up in search engine queries. Well-done videos are highly effective marketing and content tools. How-to, product feature and get-to-know the company videos give customers a clearer picture of who they’re dealing with. Virtual Reality is Here – Really! Well, OK, virtual reality (VR) has been here for some time. But, VR’s emergence as an online advertising tool is coming of age. Oculus Rift is set to launch a virtual reality headset in the first quarter of 2016 that connects social media and video channel platforms along with direct messaging capabilities. VR is projected to be a big hit with consumers and small businesses should be able to cash in. It sounds bad, but it’s not. At the same time Google changed its methodology to reward mobile friendly websites, it also began app indexing and factored apps into search engine results. This indexing has paid off for businesses that utilize apps. Adoption will only grow in 2016. This year, apps not only help businesses engage customers, but make life in-house easier, too. Business efficiency tools, such as apps for screening job applicants, accessing inventory and communicating with team members are examples of the ways in which an app can be used for greater productivity. Does this mean you have to pay a developer to create an app? Nope. Tools like Appy Pie and Microsoft’s PowerApps give non-techies the tools they need to easily create apps for Android, iOS, Kindle, Windows Phone and BlackBerry. Look for more programs and advanced features this year. A Wasp Barcode Technologies 2015 study found that nearly half of small businesses with fewer than 500 employees don’t track inventory. Shocking, isn’t it? Inventory sits in the warehouse gathering dust because no one knows it’s there. What a waste! Inventory management gets a boost with digital solutions like Fishbowl Inventory. Fishbowl is the most popular QuickBooks add-on for good reason. It integrates with most CRM and accounting programs so managers always know how much stock is on hand. Accurately tracking inventory means more control. Smartwatches have yet to really catch on but that’s likely to change. Apple Watch competitors plan to roll out their own smartwatches this year and consumer sales are expected to grow 35 percent by 2019. What’s that mean? It means small, small screens. Marketing strategies have to retool Web and app content for wearables through the use of list formats, or listicles, rather than article formats. Content will have to provide on-the-go information and be voice-command friendly. The wearable trend won’t completely take hold this year, but this is the year to lay the wearable content groundwork. Of course, not all tech trends meet expectations. Take last year’s popular holiday gift, the hover board. A self-balancing scooter sounds great. What could go wrong? It could catch fire, that’s what. Plugged in to recharge or not plugged in at all, they caught fire. Homes were destroyed. Major airlines banned them. VR, apps and videos won’t burn your house down. In fact, they’re ready to make a big impact. In a good way.